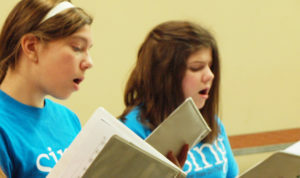 Auditions (voicings) are held throughout the year generally after concerts and then public auditions in May. However, we are pleased to hold auditions for any interested girl at any time, either in private or in small groups. No preparation is necessary, nor should a girl bring a prepared song. We will play several types of musical games to get to know the girl and her voice. These games will allow us to better understand her range, tone, and core musicianship. Auditions normally last about 15 minutes and we notify girls via email within a few days of completion of voicing. Pre-registration is required. Your specific time will be emailed to you within 3 business days of receiving your audition application. CLICK HERE to fill out the Audition Application online or to schedule a voicing or for more information please contact Audrey at sing@badgerstategirlchoir.org or call/text (920)729-4753. There is no audition fee. Teachers who have potentially interested girl students currently in 1st through 11th grades, please fill out our online form by CLICKING HERE.